soapui folder contains an XML file containing the EI project. Project must be opened in SoapUI which can be downloaded from the official website. Opening the project, you will find links to the description of methods and services. It also provides two test scenarios for the sequential execution of all operations. Run the script, wait for it to complete. In the window you may see each step of each query execution. 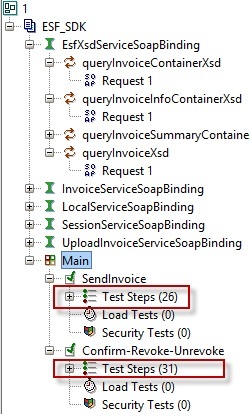 Double-clicking on the query, you will be able to see the query body and the system response. Script results can be seen on the EI IS test stand. You can enter the test stand using your own certificates.